This article originally appeared on educationcompetition.org. In honor of our [Education Business Plan Competition & Conference] 10th anniversary in 2019, we’re revisiting prior finalists and winners to see where they are today. Here’s an update from one of our alumni, 2016 Finalist, ClassTag. ClassTag is a streamlined parent-teacher communication platform operating in multiple channels that saves teachers time on parent communications and rewards them for increasing parent engagement with access to free classroom supplies. Free to teachers, parents and districts, ClassTag monetizes through curated sponsorship placement, donating a portion of the proceeds to classroom supplies and electronics. 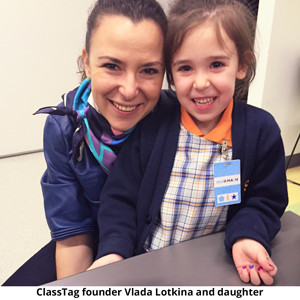 Catalyst talked with founder Vlada Lotkina about ClassTag’s journey and her advice for pursuing dreams in education technology. How did you come to enter the EBPC? As a management consultant in 2014, I was busy and often traveling for work. As a parent I was getting lost amidst pieces of paper, email and too many communication tools. I became frustrated with how fragmented and outdated the communication was between the school and the parents. I surveyed other parents and found they too felt disconnected. In an age when we can see what our friends are having for lunch on Instagram, it was shocking that we still didn’t have an easy way to connect with our child’s teacher and their life at school. One of the parents in my daughter’s class, Jason Olim, was a successful entrepreneur who had brought a company public on NASDAQ. He was interested in my mission and soon became my CTO and cofounder in 2014. ClassTag was incorporated in 2015. Our first operating year was the 2016-2017 school year. Through business connections, I met up with David Blake of Degreed. I was impressed by how much he had accomplished in his founding process. He credited his success to the Milken-Penn GSE Education Business Plan Competition. This inspired our interest and participation in the EBPC. It was our first competition. What role has the EBPC played in the ClassTag story? The competition requires you to be more disciplined about articulating your vision, your accomplishments and your plans and that is a great motivator to get organized around. It pushes the founder forward. It was a catalyst for us, speeding up our process and forcing us to be more disciplined. The event itself was a great opportunity for education thought leadership as well as a platform for networking and feedback. Being a finalist is like a seal of approval, legitimizing your company. This is particularly helpful in education, which can be a bit difficult to break into. What results are you seeing with ClassTag? Parent engagement is one of the biggest drivers of student success, and at ClassTag we focus on parent reach. We want our teachers to reach 100 percent of parents in their population regardless of the language they speak or the device they use. It’s about creating equal access. Teachers download an app or go on the website to create a class list and then invite parents to join. From the moment parents are invited they start to receive communication via email or sms text and are given the option to download an app or visit the website to see more information, sign up for conferences or volunteer. Our goal is to improve parent attendance at conferences, school functions and volunteering opportunities and to track it through the platform. We work with all kinds of schools, including Title 1 and Charter schools, which often struggle getting parents to engage. Another core benefit is improving teacher satisfaction – and we’ve found it can be life-changing for teachers. We’ve been growing exponentially. We’re now in our third school year and proud to be serving 60,000 teachers. We’ve made a tremendous impact in classrooms with donated supplies, collecting and distributing over three million dollars of free supplies and special offers to teachers who improve parent communication. What is next for ClassTag? We will continue to build up our teacher support platform by simplifying and improving effectiveness of parent communication. We are looking to do more to include supply lists, helping teachers really manage more and more of their parent interactions so it becomes the predominant parent reaching platform in the country. What advice would you give to aspiring education entrepreneurs? Seek opportunities to get as much feedback as you can. For that, the EBPC is a great opportunity. As founders, we tend to try to reinvent the build and think that your problems are unique. The more you can get yourself into an environment where you meet with founders at all stages, the more you can avoid mistakes that can be very costly, especially early on.